Free Webinar on “What’s New in Children’s Literature” presented by Infopeople: On Wednesday, May 21, 2014, Penny Peck will lead a free one hour webinar on new books for children ages 0-12. The webinar begins at Noon (PDT), and more information and registration can be found at this website: What’s New in Children’s Literature 2014. Please join us for the fun! 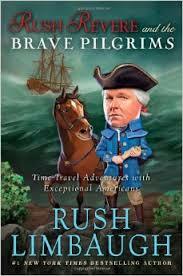 Rush Limbaugh Wins Children’s Choice Book Award: Controversial right-wing radio talk show host Rush Limbaugh was named the winner of the Children’s Choice Book Award for his novel Rush Revere and the Brave Pilgrims (Threshold Editions, 2013). The award is determined by a combination of sales and online voting, which led to criticism as adults could vote as well as children, and could vote multiple times. The book has received criticism for the plethora of historical inaccuracies.